The Connect To GL feature, for Cashmanager RURAL online databases, means that journals are no longer limited to a full year; you can export transactions in a date range of your choice. Journals are fed directly into the corresponding organisation in Xero, and the journal file is downloaded via the web for MYOB. You must be registered as an “Accountant” in Cashmanager RURAL. If you do not see the “Connect to GL” button below, please contact the Help Desk on 0800 888 080 NZ, or 1800 351 781 AUS. Alternatively, email support@crssoftware.co.nz to update your permissions. Login to the Cashmanager RURAL website. Click on the “Connect to GL” button adjacent to your client's database. Select the GL you wish to align with the database. Tip: If you don't use Xero or MYOB AO, you can let us know by sending feedback with your GL of choice in the 'Select your GL' screen. If you select 'Connect to Xero', the browser will redirect you to the Xero website to login, select your Xero organisation and authorise the application. You will be redirected back to the Cashmanager RURAL website once the authorisation is complete. new balance sheet accounts when posting from Cashmanager RURAL. Please map “Bank Transfers” to your GL suspense code. The user can then journal to the correct account in the GL. Xero users must enter the Xero rounding account in the GL mapping table. Select Edit GL codes and map your COA to the databases category and extended codes, accounts payable and receivable, and bank accounts. The first time you use Connect to GL the start month must be selected. From then onward the start month will default to the month after the previously sent end month. The period end must always be set. 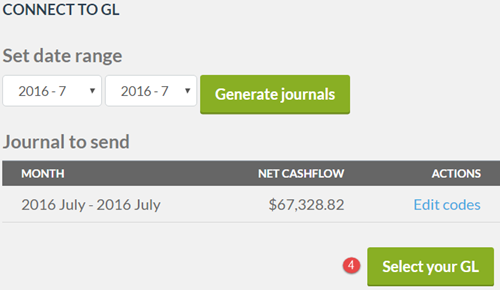 Once the date range has been, set click on the “Generate journals” button. The date range must always be within an open financial year. If you are using Internet Explorer 8 you will not be able to use Connect to GL as it is not supported by IE8. Bank reconciliations and GST returns need to be done in the Cashmanager RURAL database. automatically applied to the Cashmanager RURAL database, causing discrepancies between the systems. map the Xero rounding account in Cashmanager RURAL before exporting journals. Adjustments that relate to pre-GL export periods will not be processed. journal from suspense to the correct account in the ledger. NB: There are no suspense accounts in Cashmanager RURAL. process periods prior to the initially exported / downloaded period. please delete these journals, check that all the codes are mapped correctly then ring the Cashmanager RURAL Helpdesk to reload the batch. If journals are not deleted from Xero then they may be duplicated. NOTE: For MYOB, you can export a CSV file from the web and manually upload it into MYOB AO instead of sending it out of the Desktop or Online application.